For some reason this week has been hard. The pain has been bad, I’ve been tireder than ever and just haven’t got it together all week. I only worked in the office on one morning, and on Monday didn’t do any work at all. I didn’t even make it to knitting group, as some urgent work came up at the last minute. I have been giving some thought to what the consultant said about the possibility it isn’t endometriosis causing the pain. Maybe that isn’t the bad thing I assumed it must be. Maybe I can get some tests done, get a diagnosis and get some treatment. Maybe I’ll get my life back. I read a thread in a Ravelry forum where someone told someone else that they could be tested for coeliac disease with a simple blood test. They were however warned that they might get false negative results if they quit eating gluten ahead of the test. That got me thinking – I had a test for coeliac disease about 4 years ago. I had discovered that eating less wheat eased the pain I was getting from an ovarian cyst. Unfortunately, I had already stopped eating gluten weeks before the test…could that have caused a false negative result? Maybe I don’t have coeliac disease. But maybe there is something else going on, and it isn’t just endo. Why didn’t it ever occur to me that I could have 2 different illnesses?! I know it isn’t actually good to have 2 illnesses, but I’m clutching at straws and hoping there might be some help with the pain, in the long run at least. I can cut out gluten if needs be. Whatever it takes. I’m seeing the Dr-man on Wednesday and I’m going to ask him a) for the coeliac test and b) what else he could be testing for. I don’t have to wait until I see the consultant at the end of March (no luck with cancellation appointments so far), I could get tests done before that. It seems like a ray of light. I’ve made a size bigger than I usually would, as I want them big and cosy and really comfy. This first one is a good fit and soooo soft. When I have finished this one, I’m starting on my next KAL socks…socks for a cause. I asked my mum if she had any suggestions, and she immediately announced that she wants some pink breast cancer awareness socks. 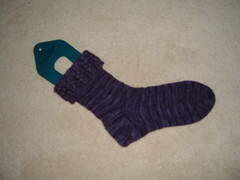 With a ribbon stitched in on the sock leg and a ribbon threaded through at the top. It looks like I’ll be designing my own,as I haven’t seen anything like that. 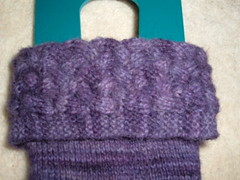 I might look for inspiration on Ravelry, as there are bound to be many out there. It’s quite exciting really. Speaking of Mum, she has pain in her scar area. She’s seeing a surgeon on Tuesday, but I’m trying not to think about it…I don’t think she’ll go for more treatment if it turns out to be bad news, if they can even offer anything. I shouldn’t be so negative, but it’s so scary. Anyway, the second semi-final of the Masters snooker is starting in a few minutes, more soon. This entry was posted on January 17, 2009 at 7:35 pm and is filed under Uncategorized. You can follow any responses to this entry through the RSS 2.0 feed. You can leave a response, or trackback from your own site.